The Ergons come from the planet Ergonar. Ergonar is the 2nd planet from the star called M. Canum Venaticorum II in the Milky Way galaxy. The planet has an estimeated population of 2.4 billion Ergons. Ergon society is made up of a variety of national governments, primarily military dictatorships. Ergons have starships with sub-light engines, but are the same technoloy-wise as Earth. They have a neutral attitude towards Earth. 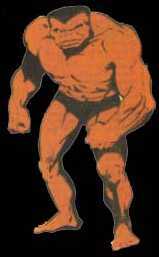 Due to their evolution on a high-gravity world(30Xs Earth gravity), Ergons have superhuman strength. Their skin is red. Note: The Ergons are a belligerent people prone to piracy. Health: 126 Karma: 18 Resources: Pr(4)/Rm(30) on their homeworld. Weight: 3*(6d10+100LBS.) for females, 3*(6d10+140LBS.) for males.